The Ace Low Profile Knee Pads by ASICS have been and continue to be a popular choice for volleyball beginners who are just learning, collegiate players, enthusiasts and even people engaged in non-volleyball related activities like dancing, house cleaning and more. Since the Ace Low Profile Knee Pads have been available for more than several years through top online retailers and traditional brick and mortar stores, there are plenty of useful consumer reviews and feedback that can assist with deciding on whether or not this knee pad would be a good option. The amazon.com 5 star reviewers really give the Ace Low Profile Knee Pads high praises like “Perfect fit” “Great knee pads” “wicked awesome” and even “No more knee pain!” According to positive reviews across all online retailers, fit is comfortable, knee pads offer good protection without being too bulky and they seem durable. 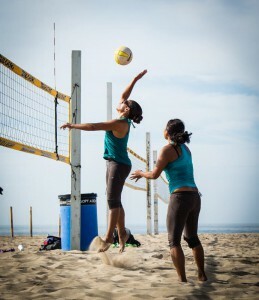 Almost every other reviewer reported using these knee pads for activities other than volleyball. Some of these activities included scuba diving, snowboarding, jiu-jitsu, dodge-ball and more. Overall great value or cost for what you get was another common positive critique. Sizing was the issue reported the most by critical reviewers in the 1 to 3 star range. For many of these reviewers “One size fits all” definitely did not accommodate all body types, shapes and sizes. Ace Low Profile Knee Pads were either too loose or too tight. Several reviewers reported circulation being cut off, lack of protection, bruising, uncomfortable fit and constant bunching up behind the knees. Although the manufacturer recommends 12″-18″ knee measurements, it might be best to consider the Ace Low Profile Knee Pads only if your knee measurements are between 14″-16″ This could help alleviate potential sizing issues. Despite the “one size fits all” sizing limitation, the ASICS Low Profile Knee Pads still receive positive reviews on a regular basis. That would be something to think about when comparing this knee pad with competitor offerings. 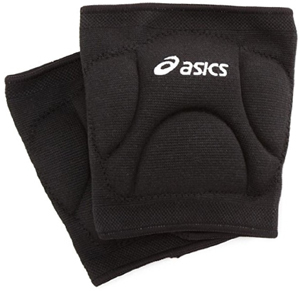 ASICS Ace Low Profile Knee Pads can be purchased through a variety of online retailers and traditional sporting goods stores. With free shipping after minimum purchase to most areas and easy returns, amazon.com is a top choice for purchasing the Asics Low Profile Knee Pads.